In their second year sailing together, the Nina and the Pinta docked along the Mississippi River in Burlington Thursday afternoon. The ships are replicas of what Portuguese explorer Christopher Columbus used to sail across the Atlantic Ocean more than 500 years ago. Captain Kyle Frieauf heads up the Nina, which has been called the most historically accurate replica of a Columbus ship ever built. He’s been with the Columbus Foundation for about six years. Frieauf says he slept through history class as a kid and now that he’s older, especially since he’s captaining a historic ship, his interest in history has been rekindled and he’s learning a lot. Frieauf is one of six members of the crew on the Nina while the Pinta has a crew of eight. He says they’ve sailed up dozens of rivers while also spending time on both coasts, the Great Lakes and the Gulf of Mexico. He says it’s a fun adventure and he feels like Columbus as there’s something new around every turn. 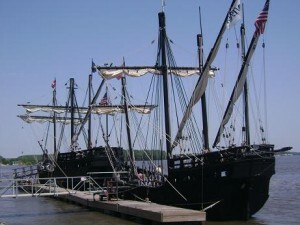 The ships will be in Burlington this weekend before setting sail again Monday. After stops in Minnesota and Wisconsin, the ships will return to Iowa with a planned visit to Davenport. For a complete schedule, go online at “www.thenina.com“.